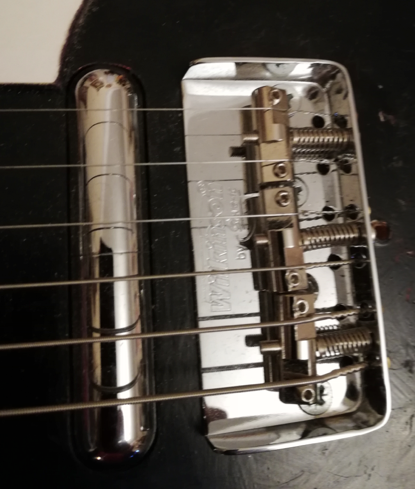 So having fitted a short tail Tele bridge on my U2, it ain't working so good. Kinda rings and unfocused, made the guitar harder to play than the original bridge. Hoping Jeff's bridge might sort things out. Action is ok but high, still seems to buzz around a little whatever I do. Jeff's site seems to be down, hoping he may see this and help a dude in distress! here's the current bridge. Simple style of bridge but I admit it was cheap, just thought it'd still work ok. Am I missing something? Yeah, my site has been down for a few months, server host company was bought out and never migrated our site, never notified us, sorry about that. I sell the bridges on Reverb.com as well, with and without saddles. You could use the saddles you have (although most folks tell me they like the sound of our saddles) but you would need our longer intonation screws and springs which I provide. Shimming the neck is often needed with our bridge as well so maybe try that first with yours? Shimming the neck can help to increase the break angle of the strings over the saddles. This also allows you to raise or have more adjustment possibilities with the saddles. Sonic advantages can be more energy transfer of the vibrating string to and through the body and punchier attack. Physical advantages can be better string placement stability (strings don't slide around on the saddle) and the saddles themselves can be more stable in place since there is more pressure on them.